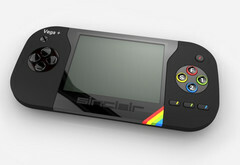 Retro Computers Ltd. has offered a release date for its controversial handheld games console, the Sinclair ZX Spectrum Vega+. The crowdfunded console is based on the Sinclair ZX Spectrum, a popular personal home computer that was released in the UK in 1982. The company behind the beleaguered Sinclair ZX Spectrum Vega+ handheld games console has offered a date for units to finally start shipping: April 2018. However, according to the device’s Indiegogo page this is an “estimated delivery date,” meaning the Vega+ could be shipped earlier or later. The console, developed by Retro Computers Ltd., has faced various controversies over its lifetime. A number of different dates, going back to September 2016, have been offered as official launch dates yet the device still hasn’t hit the streets. Delays have been caused by senior management changes, legal disputes and production issues. With more than 4,700 backers, the crowdfunded Vega+ has had over £512,000 (~$717,790) in funds raised for its development and release at the time of writing. Indiegogo is pushing Retro Computers to fulfill its launch date pledge; otherwise a collections agency is likely to be appointed by the crowdfunding site to try to reimburse the Vega+ console’s thousands of backers. One of the main selling points of the Vega+ is the inclusion of 1,000 licensed games that can be played either solely on the console or through a connected TV. Other features include a screen resolution of 256x192 pixels and SD card functionality. The handheld console is based on the famous 8-bit ZX Spectrum personal computer which sold over five million units worldwide.